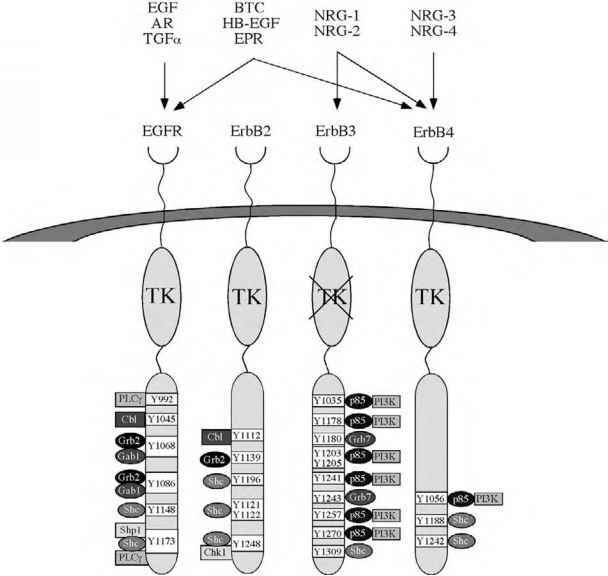 Figure 1 Schematic representation of the components in a class I TCR/pMHC/CD8/CD3 signaling complex. 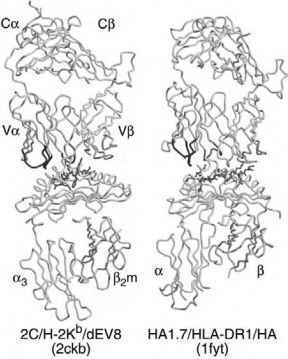 The heavy chain consists of the a^a3 domains, to which the light chain P2-microglobulin (P2m) is noncovalently attached. The peptide-MHC (pMHC) complex is anchored to the plasma membrane of the antigen-presenting cell via its a3 domain while the a^2 super-domain binds the peptide (□). The CDR loops of the ap TCRs recognize the pMHC complex, while the coreceptor CD8 binds simultaneously to the a3 domain either as an aa homodimer or an ap heterodimer. 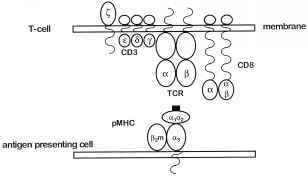 The signal from the pMHC complex (if any) is then transmitted through the T-cell plasma membrane by the CD3 signaling modules. Phosphorylation of the CD3Z chain by the ZAP70 kinase (not shown) is an early step in this signal transduction cascade. difference between antibody/antigen and TCR/pMHC recognition is that the specificity of the former is dependent on high affinity (Kd is nanomolar) for the free antigen, whereas in the latter low affinities predominate (Kd is ~0.1-500 ^M); thus, specificity must be ensured by a different mechanism. 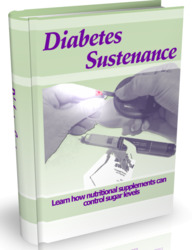 Possible mechanisms are outlined in the following sections. Figure 2 Similar structural architecture of class I and class II TCR/pMHC complexes. The Ca traces of the TCRs [34,51] are shown on top with the colored CDR loops contacting the pMHC at the complex interfaces. The Va and Vp domains are positioned over the N-terminal and C-terminal halves of the peptide, respectively. The peptides are drawn as red ball-and-stick representations and have fixed termini in class I MHC but can extend out of the binding groove in class II MHC. The CDR loops are colored as follows: CDR1a (residues 24-31): dark blue, CDR2a (48-55): magenta, CDR3a (93-104): green, CDR1P (26-31): cyan, CDR2P (48-55): pink, CDR3P (95-107): yellow, and HV4 (69-74): orange. surface. This bias in chain usage has also been noted for antibodies, where VH usually provides a larger contribution to the antibody-antigen interface . The suggestion that only a few up-pointing peptide side chains contribute to the specificity of the TCR/pMHC interaction  was confirmed by TCR/pMHC crystal structures. In class I, these interactions are dominated by the peptide residues that extend or bulge most out of the groove and, hence, represent functional hotspots  in the TCR/pMHC interface. For nonamer and octamer peptides, these represent residues P5, P7, and P8 and P4, P6, and P7, respectively. For class II peptides, the key side-chain contributions are more uniformly dispersed (P1, P2, P3, P5, P8). On the other hand, the contribution of the peptide backbone to TCR interaction is very modest for both class I and class II, where none to only a handful of contacts are made. The only exception so far is for the HLA-A2/Tax complex, where the large P4-P5 bulge includes a glycine at P4 that enables the TCR to access the peptide backbone [14,19]. compared to CDR30. In Va, CDR2a tends to have fewer contacts with the pMHC than CDR3a, although an exception is found in the allogeneic BM3.3 complex, where CDR3a has almost no contacts (see above). However, in most cases, peptide contacts are made primarily through the central CDR3 loops, which also exhibit the greatest degree of genetic variability. In contrast, the majority of conserved MHC contacts are mediated by the CDR1 and CDR2 loops , particularly in Va.